The current global trend is to camp in luxury, comfort and style without losing the ambience of nature and the outdoors. A general term used in the European market is glamping, to indicate glamorous camping. 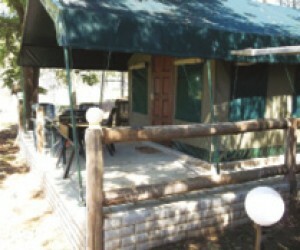 Canvalodge Manufacturers are specialists in the manufacturing of tents and canvas products. We are known for designing and developing products that are unique and pay special attention to customised detail, individual support and care for specific needs of our clients. 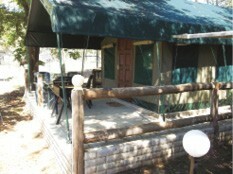 Canvalodge Mnf has adopted this new trend by providing quality, durable and functional Safari tents. Our Safari Tents are permanently installed (no more pegs and guy ropes requiring constant tensioning) and have proper air vents for positive air flow. They also feature a double cover or flysheet for extra heat reduction and protection. At Canvalodge we tailor make our tents for comfort in the wilderness by adding those nice-to-have features to most of our tents. The dome tents have, for instance. pockets below the windows for small items like a torch, toilet paper, your copy of Explore magazine, etc. The Safari lodge tents feature extra storm anchors to be used in severe weather conditions. Our frames can be “hot dip galvanized” for additional protection in coastal areas and other places where rust can cause problems. Canvalodge Manufacturers also adjusts the size of our Safari Lodge tents and certain camping tents to meet client requirements and there are a range of variables for doors, windows, ground sheets, flysheets, etc. We constantly alter the standard layout of our tents whenever possible and keep things cost effective to make sure client requirements are met. Canvalodge Manufacturers does not have a research and development department to focus on new tent ranges per sé, but we take note of client requests and new product ranges to improve our tents. We also use camping experience, feedback of clients and lessons learnt to constantly improve our tents. As tent manufacturers we do design, develop and manufacture various tents to meet client requirements which are not readily available in the retail trade. Thus our products are tailor made to requirement or specification. All materials used are SABS approved. As an example, Canvalodge Manufacturers were required to provide a tent to be used as a messing facility at the Kubu Kweena Lodge in the Kafue National Park in Zambia. The platform and building was already completed when we received this request. We designed and manufactured a HIP Tent with a double flysheet to fit over this structure. Some of the sides had to feature gauzed windows and remain open completely, and some had to remain fixed. We at Canvalodge Manufacturers know that each client has individual needs and sometimes unique requirements and we will take great care to provide for these. As part of our support we also train and inform clients about the do’s and don’ts when it comes to maintaining our tents. We are also available for expert advice etc. during planning, installation and after care for our products. We assist with normal wear and tear of canvas when possible by means of a new but limited coating procedure to extend the lifespan of ageing tents. Canvalodge Manufacturers must comply with the highest standards as a registered exporter and local military supplier. The business has existed since 2007 and is well established to comply with the international standards required for export. Our personnel can operate well under pressure and still maintain the required standards due to their accumulated experience and expertise. They know the military specifications required for the manufacturing of tents and we apply these with all products. Our Safari Lodge tents and camping tents were exposed to extreme windy conditions in France and were able to withstand them despite destruction and damage caused to other infrastructure around it. Besides our South African clients, some of our satisfied international clients include individuals, owners of safari tour operators, game lodges and tented camps from all over the world like Australia, Brazil, Ghana, Kenya, Mozambique and Tanzania to name but a few.